Layouts, Scenery Tips, Track Plans and More! To Save You Time & Money In Creating A Model Train Layout You'll Be Supremely Proud Of! Would You Like To SAVE Up To 72% on The Retail Price Of Model Trains And Accessories? Would You Like To Avoid The 6 Mistakes Nearly Every Railroader Makes...And Save An Enormous Amount Of Time And Money? Would You Like Straight-Forward, REAL Answers To Creating An Amazing Layout Within Your Space And Budget? Would You Like To Know How The Difficult Tasks Can Be Made Quick And Easy? Would You Like 100's Of Clever Tips On How To Prevent Derailments, Fix Loco Problems, Create Incredibly Realistic Scenery... And Much More? to save you time, money & frustration with your model railroad layout! This easy-to-follow, step-by-step, truly comprehensive "Model Train Help" ebook, is a valuable resource for the beginner or advanced model railroader. Just imagine having "Model Train Help" to guide you every step of the way, as you create an extraordinary model train layout that other modelers only dream about. You too can learn the skills and methods used by experts to create some of the most astonishingly effective model railroads in the world. This is a valuable resource you won't want to be without. We all know that Model Railroading has been described as, "The World's Greatest Hobby", and it sure is! Yet, things CAN and DO go wrong...derailments, a motor burnout, scenery disasters, or when an electrical short grinds the traffic to a halt. Unexpected problems can take forever to solve and the right answers can be hard to find. Truth is; it doesn't need to be like that! Most things are either preventable or fixable. It is all about knowing where to find the answers, the best way to do things and how to solve problems quickly and easily. That's what my step-by-step "Model Train Help" ebook is all about. It is jam-packed with proven techniques, solutions to problems, clever short-cuts, creative ideas, useful model train tips, and "little-known" secrets... with all the difficult tasks made EASY! It is a model railroaders dream come true! to create a model train layout you'll be supremely proud of. Indeed, "Model Train Help" takes all the guesswork out of setting up the perfect model railroad layout... complete with a raging waterfall, a fire setting with smoke, natural-looking trees, easy to build roads, rippling stream, historical buildings, an interesting branch line, classification yard, spectacular mountains, fields & fences, curved tunnels...it is all here for you! "This is by far the most complete and easy to understand book I have ever seen about model railroading. Not only did I learn how to improve my set, but I also learned several new tricks to impress my train club friends!" save money and avoid costly mistakes!" Lets face it; creating and operating your own model railroad should be FUN! Yet, sadly, many modelers slave for hours, weeks, even a lifetime struggling with time-wasting problems and repairing expensive mistakes. You and I both know that building a model train layout and fixing problems should be enjoyable, NOT frustrating... and why would anyone want to waste big bucks buying or replacing something that can be easily made or fixed for a fraction of the cost. Listen carefully, because here is the key. To save yourself money, time and frustration, it is important to do things correctly. Afterall, your ultimate objective is to create a model train layout you'll be supremely proud of... a custom designed train layout that can be enjoyed not only by yourself, but by friends and family too! 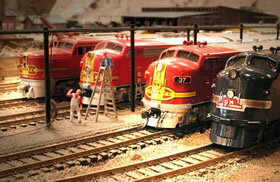 Take all the guesswork out of setting up the perfect model railroad layout. 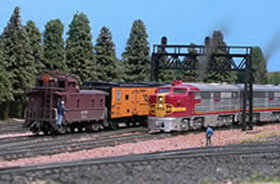 Easy to follow action steps to quickly and easily get your model train layout functioning right. Knowing what to buy and how much to spend... ...the types of sets to purchase and what NOT to do! Discover answers to the difficult questions everyone wants answered! WAYS TO SAVE MONEY and how to spot the best buys in model train accessories. Why the cheapest isn't always the best...even on a budget. The things that don’t work and what you can get for FREE! Find out where to see the “ultimate” layout with 8 miles of HO track and 10,000 freight cars. Save Time, Money & Stress! 5 easy steps to building your layout...easy-to-follow instructions from drawing your first sketches through to your working model railroad layout! 4 layout options to consider (plans included) and which one NOT to choose. EXPOSED: The biggest MISTAKE and stumbling block to building a layout...and how to avoid falling into the same trap! Choosing a theme and how to select trains, buildings and scenery to match the historical era or geographical zone… and where to research facts at NO COST! 87 quick tips to building a better train layout... (many of these secrets are known only to the most experienced veteran modelers). “To die for” - a list of valuable model railroad resources... and contact information for the top train layout and accessory manufacturers....and where to go for expert advice and get all your tough questions answered. The very best ways to plan for track-work changes and extensions to your railroad once it's built. Tricks of the trade revealed! How to define your layout space... and eliminate or work around potential dangers and problems like beams and pipework. REVEALED: The 6 things to save you from costly mistakes when buying a locomotive. The truth about the diesel locomotive NOT to buy! Where to start when buying rolling stock. What to look for... how to select what's best for you... and what you absolutely MUST avoid. Which couplers to choose and how much to spend. Learn the two things you need to prevent a locomotive from suddenly speeding up or falling off the track. Secrets to "test-driving" your new locomotive and precisely what to watch out for! EXPOSED: The kind of tire to NEVER use! Most of the time they don't work properly and can cause irritating problems. Discover how a locomotive works and why some locomotives out-perform others. The very best ways to prevent cars from constantly running off the track! Clever Ideas & Useful Tips! Secrets to weathering revealed: The quick and easy ways to give rolling stock and structures an aged look or the appearance of wear and tear... and what NOT to do if you want your buildings to look real! What the bathroom cabinet holds that will give a road crossing a more authentic look. The little-known insider secrets to bring cheaper rolling stock to life! The hidden mistakes that will get noticed... and are easier to fix at the construction stage. How to check that automobiles, people and signage is right for the setting...plus 9 essentials tips for creating more realistic scenery. The ingeniously simple secrets to replicating rust, mud and even tire marks to add realism! The simple idea that will really impress your friends! Techniques to bring your model to life. What to include in your layout for added interest, reality and excitement. Which transformer to choose... you'll avoid problems and save yourself from hidden costs. What NOT to buy and how the different power packs compare. The type of engine you should NOT run with a starter transformer. The precise minimum current you'll need to run various accessories... and when to use more than one power pack. Which pack BEST simulates the stopping and starting of a real train. Find out how to get smoother acceleration and improved control at lower speeds. The power pack that allows you to stop your trains more quickly. How to prevent interference problems between wiring on your model railroad. The amps you'll need to comfortably run 1, 2, 3 or 4 trains! EXPLAINED: How a circuit breaker works to provide protection! Insider secrets on larger power packs...pilot lights and meters, more operating modes, extra terminals for accessories like walkaround and infra-red wireless throttles...what they offer. What the technical terms and abbreviations mean in simple terms. All the complex stuff made easy to understand. 2 surprisingly simple tables explain the different gauges, scales, boxcar lengths and more. Discover how scales and gauges compare to full-sized trains. 8 ways to select the right scale to match your needs. The pros and cons of choosing O, OO, HO,N or Z. Select right and you'll avoid problems later! An ingeniously simple way to set up your power pack for easier access and use. Cut through the technical gobbledygook. Terms like: "scale", "back emf", "narrow gauge", "turnout", "HOn3", "command control", "circuit breaker", "boosters" and "minimum radius" ...all made simple to understand! How to use flywheels for smoother, more realistic running. The simple way to do advanced things like track section wiring and turnout motor wiring. Step-by-step illustrated tutorial on wiring for two train operation. 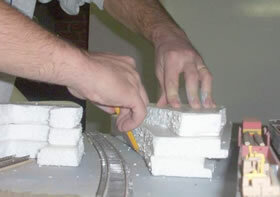 The right track geometry for the laying of parallel track shown step-by-step. Exactly how to do interchange track...and why include lots of switching. The 5 low-cost and no-cost, fun ways to make natural looking trees explained step-by-step (with tree profile drawings). The BIG MISTAKE to avoid when making trees. Techniques to make your town scene more realistic with less effort...and the quick, EASY, inexpensive way make windows, telegraph poles, old signage and even how to make a pile of old tires for a scrap yard scene. REVEALED: The easiest way to construct your own tunnels...and how to color and finish them for dramatic effect. The common household items that make fantastic ground cover, rocks, roads, fences and scenery props for little or no cost. A model train veteran of 28 years reveals his low cost scenery tips. Ingeniously simple fire scene techniques: Discover ways to make smoke and flames that look so real your friends will wonder how you create the magic you do! The very best techniques to make your own roads. 2 easy to follow methods explained step-by-step with clever finishing touches to add amazing realism. The LOW-COST pet product to use in creative ways on your model railroad. Simply amazing ideas to make your own grassed meadows and mountain landscapes with stunning realism! Want to know the most effective ways to make rocks, weeds and even hay to add visual appeal to your model? Clever techniques to create a tranquil pond, drainage canal, raging waterfall and rippling stream. Which materials work best. EASY and FUN! You just need to know how. New step-by-step photo tutorials including: how to electrically join two baseboards, the easiest way to build a frame and baseboard, how to solder track, lay ballast and more! 4 different track options explained...how they compare... and which rates BEST!! What to do when track won't work properly! The single BIGGEST cause for trains to run erratically. Should you choose roadbed or standard track? The secret to using curved track that prevents derailments! How rail joiners work...and how to stop them wiggling loose and causing derailments. The best way to use sectional track...and the new options you'll get with flexible track. The rails that need most cleaning – what to avoid! How you figure grades and how steep they can be! Do you need to solder track? How you lay and fix ballast on track-work to get the most realistic look! The different track options to turn an engine! The ingeniously simple ways to repair minor faults yourself without having to pay for repairs. 5 track cleaning methods explained and the thing you MUST NEVER do. How NOT to damage your trains or layout when cleaning (it‘s easy when you know exactly how!). The quick tip that could save you costly repairs! The easiest, safest, and "almost free" way to clean your track. Hidden dangers to avoid...how NOT to clean your track! When to hire a experienced repairer...how to contact a good one...and what you MUST ask BEFORE entrusting them to repair your train layout. Discover why some locomotives make a racket and how to prevent the problem. 3 things to do if your locomotive frequently stops or slows down in the same spot on the track. What to do if your locomotive sits and hums, but won't move. Broken flange, twisted wheel, defective or stuck coupler, track out of alignment...what to do. How to dislodge decals without damaging paint! The common cause when locomotives become wobbly and fail to pick up electricity. The type of tire to avoid at ALL COSTS! Find out if you should oil your trains? What you should do if your engine freezes when being fed current. How to prevent motor burnout! Try this simple test to see if your locomotive is working too hard. The wetting agent that works BEST for N scale ballast...why NOT to use a water/detergent mix! Explained: the term 'module' and how they work best? How to relocate your layout without harming it. A model train enthusiast for 32 years spills the beans on how to make trains run better without constantly slowing down. The truth about derailment problems... the causes identified and SOLVED! Where NOT to put your train layout...plus safety tips to prevent disasters! Storage issues explained. How to safely store electric trains... and what you should NEVER do. Revealed: The "hard to find" place to get model train video downloads and train sounds for FREE! How Analog and DCC operating systems compare. The pro's and cons revealed! Find out how to operate more than one turnout motor from one switch. The tricks to avoiding hidden 's curves'...the cause of messy derailing accidents when using longer cars or certain locomotives! The very best way to avoid wiring problems! Adding easements so that your model trains can negotiate curves with ease...and when to locate them in vertical curves. Find out the tiny adjustment that prevents damage to buffers. Learn the truth about buying a DCC system. The surprising omission most people don't expect. The ingeniously simple tip to detecting a locomotive decoder. The little-known secret that will save you time locating faults! How to make an LDE project work BEST for you... what to look for when modelling a real life railroad... everything explained from choosing your prototype (full size railroad)... everything from how to define your layout space to designing and building your layout! The BEST track underlay to tone down noise levels on your train layout. The easy to use software for 3D rendering that helps eliminate mistakes... and helps determine exactly what's needed for a track layout! Learn what you need to do when wiring for a reverse loop. Step-by-step diagrams. Z scale, O, S, HOn3, G scale and more. This is just a small sample of what you'll learn in this revealing model railroading ebook (153 pages of help) that tells you everything you could ever need to know from what to buy, how to plan, build, repair and maintain the perfect model train layout... 100% Guaranteed! and your order is placed securely through Click Bank). "The best book I have seen yet on model railroading! It covers the whole spectrum of creating a layout with valuable tips and ideas. I am now clearly focused on which way to go. Thank you." Brian Ward, Johannesburg, South Africa. "Lots of great little tips for both beginner and expert. The list of references is worth the price alone!" See Below For 6 Amazing BONUS GIFTS! "After spending all last week trying to figure out why my trains kept stopping, I'm so relieved I found your book on Google. There, staring me in the face on page 114 was the solution. I could have saved myself countless hours of frustration. It is an excellent resource that more than paid for itself with this one answer. I'm very grateful thanks!" IL. USA "I've learned a lot about making scenery look realistic. Robert's ebook has provided simple, easy to folow techniques from the type of material to use (foam board, molding plaster, etc.) to simple airbrushing in order to give the illusion of depth, shadows, and natural ground color. I have never regretted signing up for the Model Train Help ebook (have been receiving tips for 3+ years), it has provided a wealth of knowledge over the years and doesn't disappoint." 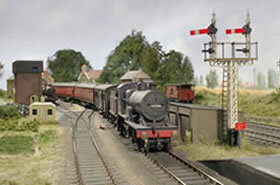 "Real life scenery is very important and the Model Train Help Part Ebook does a great job on explaining how to make it. Just how do you make the trees to look so real and the mountains to look like you are right there in the scene. The instructions are very simple and easy to understand. What else is there to say, except you need to purchase the Model Train Help Ebook for all your answers you will ever need. Even if you have been in the hobby for several years, there are always different paths to reach the same results." All Of Your Model Railroading Questions And Many More! If I install a larger motor in my locomotive will I be able to pull more cars? What's wrong when a part of the track will not work? How do I go about fixing it? Should I replace my horn-hook couplers with knuckle couplers? What is rust-busting, a talgo truck, "head-end" traffic, a green wave for freight trains? What is meant by "code", as in code 40 track? Is a locomotive change-over the same as shunting? Which rails should I use - brass, steel or nickel-silver? How do I make plastic buildings look real? Why do some buildings look translucent? Should electric feed wires be included every couple of feet or should I solder rail joiners? What is a bridge rectifier and what does it do? When I buy a track switch, what is meant by 'No. 4 turnout' or 'No. 8 turnout'? Running techniques for a locomotive on a reversing loop. What about stopping the loco on the loop and throwing the switch? What is a decoder and can I run an analog locomotive on a DCC system without a decoder? Are 'O-gauge' and 'O-scale' the same thing? Is there a right and wrong way to cut track? If I have limited space what should I leave out from my layout? What is a classification yard and how does it work? What are the yard options? Should I have a run-around track and dedicated lead track? What's a Capacitor Discharge Unit and a Solenoid Motor and what do they do? What's the difference between DC and DCC? What do I need to start or convert my analog layout to a DCC system? What's the difference between service mode and operations mode? Can I control turnouts with DCC? What's a booster? Will the ampere rating of a booster and power supply limit how many locos I can run at the same time? What causes a train to short out on a turnout? A Better Model Railroad Tomorrow! "Mr Anderson, wonderful model railroading guidebook. Nothing could be clearer and more precise. I never thought I could handle making something like this, but you made it extremely simple. I am about to make my first reverse loop following your instructions. I now know I can do it." "This is a great book, full of lots of useful tips, techniques and advice on all aspects of model railroading. Well worth buying"
Kevin Maher, Christchurch, New Zealand. So How Much Is All Of This Worth To You? but, I can put your mind at rest. Others have told me - the same information in physical books would cost you over $450.00. Model Train Help contains extremely important information that is likely to save you thousands of dollars over the lifetime of your layout. But, I won't be charging you anything like $180... even with direct access to all the FREE BONUS GIFTS (see below). The bottom line is; "Model Train Help" will save you time, money and frustration... and, if you are decisive and take action today, you can grab a genuine bargain at only $39.97 - includes FREE BONUS GIFTS (see below). In short, it is a fraction of it's true value in terms of what it will do for you and what it cost me to research. $39.97 is a fraction of what this information is really worth, compared to the time and money you'll save by having these valuable tips and ideas. Here's The Best Guarantee You'll Ever See! Truth is; I want to help you to save time, money and frustration with your train layout, so that's why I'm also offering you these 6 BONUSES if you buy TODAY. Guarantee: This ebook comes with a no-questions, no quibble,60 day money back guarantee. If for any reason (or no reason), you decide this information won't help you with your train layout I'll buy it back from you for every cent you paid. That's 60 days to put me to the test - all the risk is on me! What could be fairer than that? There is absolutely no risk, whatsoever on your part. The burden is entirely on me. FREE BONUS GIFT #1. (worth $27.00) Model Railroad Yard Design Explained Step-By-Step (with diagrams). What is a classification yard and 9 steps to creating classification yards. What you absolutely MUST HAVE to avoid yard problems. 6 tips to avoid train congestion and make your yard easy to run... and much, much, more! You get this report FREE today, even though it sells for $27.00 everyday here. FREE BONUS GIFT #2. (worth $27.00) Model Train Layout Track Plans. 22 ready-to-go scale TRACK PLANS (with parts lists) for you to use. Includes: A Mainline & Industrial Layout, Mountain Railroad Layout, Switching Layout, Double Track Layout, Rail Link Layout, Yard Layout... and even a Multi-Level Railroad Layout. You get this report FREE today, even though it sells for $27.00 everyday here. FREE BONUS GIFT #3. (worth $27.00) Secrets To Building A Garden Railroad - Finally garden railroad veterans reveal how to make it easier than ever... the type of roadbed that's best (cement or gravel)... the best kind of rail to use for garden railroads... the maximum grade for your garden railroad... where to get those tiny plants... how to care for your garden railroad even in snow conditions... and more! You get this report FREE today, even though it sells for $27.00 everyday here. FREE BONUS GIFT #4. (worth $27.00) Mastering An Airbrush Step-By-Step. The secrets to using an airbrush for weathering buildings and trains. How to best mix paint to stop it from spluttering. The easy to use kitchen product that will save you money. Step-by-step diagrams for controlling the flow of paint...and a clever tip to stop moisture dripping on your paintwork...and more! You get this report FREE today, even though it sells for $27.00 everyday here. FREE BONUS GIFT #5. (worth $27.00) Comprehensive List Of Model Railroad Resources... a really useful list of magazines, related books and hard to find websites for track layouts, model railway electronics and scenery/construction techniques. You get this report FREE today, even though it sells for $27.00 everyday here. FREE BONUS GIFT #6. (worth $27.00) 8 Model Railroad Videos - That's 30 Days FREE Access. I'm giving you free access to have a look at 8 of the 42 "member only" videos to help you decide if you want to remain a member. Bonus #6 is optional. If you don't want the model train and tutorial videos, you will be given the choice before completing your order. These 42 amateur model railroad videos (no they're not Hollywood productions), feature detailed scenery and layouts, step-by-step tutorials, quick tips, solutions to problems... and lots of inspirational model railroading ideas! Download a FREE video sample here. Now that's a GENEROUS OFFER (the bonuses alone are worth $135), but you'll need to be quick! So why am I giving you all this for just $39.97? Simple... Everything is delivered by download as soon as your payment is processed. So there are no shipping costs and am passing these savings on to you. You'll get 6 PDF files which are readable on any computer, PC or Mac. You simply save the file on your computer, so you can read it anytime day or night, access it whenever you want. It works on any computer! The download takes just 4 to 5 minutes on the slowest dial-up internet connection. Other internet connections will be considerably faster. You are welcome to print whichever parts you want. I did look into printing physical copies, but these would have cost more than 3 times the price of this offer due to printing and shipping costs. I thought it best to keep it affordable. That way more people can access this valuable information. The videos are the popular easy-to-download mp4 format. "ONE tip that saved me HOURS of frustration and sore fingers was worth the entire book!!! (the ONE tip?? Filing down a length of rail to use as a "spreader" for rail joiners..I'd STILL be cursing and bending joiners without that tip!!!) Everything else is icing on the cake!!!" "I have loaded it on my E reader and when flying for work between cities I read and study model train help on the present project. I often have found the answers to questions so I can hit the ground running on return. Answers to questions on hot frogs. Getting my head around DCC are two areas I struggled with and found good clear explanations in the Model Train e-book. Go for it." Think about it... $39.97 is a meager amount for so much valuable easy-to-follow, step-by-step information. And you could be reading it on your computer within 5 minutes. Secrets To Building A Garden Railroad with the 17 critical do's and don'ts of building a garden railroad without making mistakes. 8 Model Railroad Videos - That's 30 Days FREE Access (normally $27) to the 42 Amateur Video Series which is a month to month membership. I can have a look at these videos and if I cancel within the free 30 days I won't be charged again. I can cancel easily by using the link on the main download page . If I do decide to remain a member I can still cancel in any month and will not be charged again. Better yet, If I decide to continue receiving videos, my monthly membership will be discounted over 44% to just $14.95/month for 5 months after the initial charge has been made (that's a crazy $2.19* per video!). Click here to order without the bonus videos. I also understand that I will get immediate access, so I can start using these techniques without delay. I can view everything on my computer, and even burn it to a disk or print out what I need. If you act NOW, I guarantee you'll get ALL the FREE BONUS GIFTS! P.S. Seriously, if you are genuine in wanting to build and operate a better model train layout... and want to learn 100's Model Railroad Tips, Secrets and Little-Known "Tricks Of The Trade"... and want to get ALL 6 FREE BONUS GIFTS... and still qualify for today's LOW price - You'll need to be quick and order TODAY! PLUS Remember, you're getting your "Model Train Help" ebook with 6 FREE BONUS GIFTS and everything explained step-by-step... clever short-cuts revealed...plus a list of valuable model railroad resources... the supplier contact information you need... ways to save time and money... solutions to difficult problems... technical terms made simple... all 100% Guaranteed. So, if you want to build a model train layout that you will be supremely proud of, this is a valuable resource you won't want to be without. PLUS And remember, you'll be able to download "Model Train Help" immediately. Five minutes from now, you'll be able to get started! No shipping - No Waiting! "You answered so many questions that are almost impossible to find anywhere else. Believe me, I've tried. Thank you Robert, I know it will be something I will reference DAILY!!" "I read your ebook all in one sitting...couldn't put it down! Great reading and straight forward giving lots of ideas. I especially enjoyed the quick tips throughout the book. It beats all the other info I have seen, hands down!!!!" Kidderminster, United Kingdom "As I was preparing for retirement, My wife bought me a train set. Once I had my set the question was what do next. So I started looking for help and oh boy I came across this guy named Robert Anderson and his e-book. I got and it was so full of good, interesting and helpful information I was well away and still use it. If I didn`t know what to do I reached out for the book which not only told me what to do but how to do it. I would recommend this book to anyone who wants to start Railway modelling young or old." "Mr Anderson I find your information helpful and pictures are very well done. I can always count on being able to use your product and understand how it can be used to help me and am still be satisfied with results to help me and my hobby, thanks again." "I have been a long time admirer of model trains. The e-book was easy to down load and easy to understand. For the price it is too cheap. The info,and links are great and filled with valuable info,you would have to buy a book case full of books to get this information on model railroading. The tutorials are even better than i thought they would be. Thank you so much for you expertise." NOTE:Clickbank sells our products - they are a trusted online retailer specializing in digitally delivered products. Internet Security Note: The secure order form on the next page will look like this. If you are new to ordering products online click here to get more information. South Africa, Sweden, Germany, China, Singapore, Italy, Spain, France, Denmark, Iceland, Taiwan, South Korea, Argentina, India, Belgium and Japan. Download Model Train Help Now!